There’s always something major to be done on a farm. If you don’t have the equipment or connections to accomplish the task, it’s time to give Triple L Feed & Supply a call. We consider ourselves your farming partners, and we’re eager to help you in any way we can. Need to load or unload a semi truck or flatbed? You need a super-duty forklift. 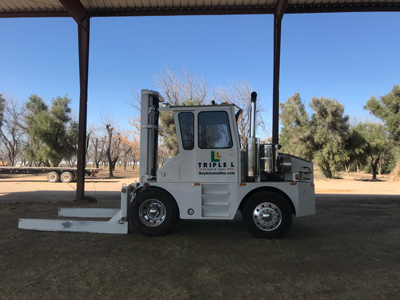 Our Road Runner hay squeeze makes loading and unloading safe and easy, and we’d be happy to hire it out to you. Contact us to learn more about this powerful yet nimble machine and what it can do for your farm. If you have roosters or hens you can no longer care for, give us a call. We have three cages where we can keep them until we place them in new, happy homes. There’s no need to go through all the hassle yourself when we’re here! At the end of the day, we’re passionate about partnering with farmers in our community and around the world and helping them find success. As farmers ourselves, we know all too well how difficult it can be to get everything done that you need to even under the blazing Arizona sun. We constantly strive to make your job easier by providing you with simple access to high-quality products and services that can be found in one of our two locations or delivered directly to you. By growing all of our own feed, we are able to provide you with unbeatable prices that can’t be offered anywhere else. Whether you need supplies delivered to your barn, a semi truck unloaded, or a rooster re-homed, or any other products or services, contact your Marana feed and supply experts. We’d be glad to hear from you!